There can't be very many golf communities that have as interesting and heart-warming a back story as the Concession. Situated amidst protected wetlands and towering stands of oak, magnolia and pine trees that were left untouched during the construction of the course, the setting is breathtaking. But this place is so much more than its setting or even the challenges of the course itself. It's a testament to friendship and good sportsmanship. The course was co-designed by Jack Nicklaus and Tony Jacklin and was opened in 2006, almost forty years after the historic event which sealed their friendship and gave the course its name. That event, "the concession", came in the final moments of the 1969 Ryder Cup, which Nicklaus conceded his final put to Jacklin. The result was the Cup's first tie, ending what had been an acrimonious tournament on a high note and beginning a lifelong friendship. The course that the pair designed together all those years later is worthy of its storied history. Every vista is spectacular. There are exceptional water features along the course and only a few rooflines are visible, so you can really concentrate in your game. The championship course measures 7474 yards but there are options for golfers of all levels. There are no parallel greens, so varying wind conditions make every hole a different challenge. The course has won many awards since its opening, including being named the best new private course in 2006 by Golf Digest and being named to their top 100 courses in 2009. The Concession real estate consists of just 236 homes and home sites on the 1200 acre site. The lots are all over half an acre in size, ensuring maximum privacy and tranquility. The community is divided into four neighborhoods. Residents of Birkdale enjoy lots between 3/4 and an acre with woodland and lake views. For those looking for more space Linkrick offers lots between 1 and 2 acres with a 50' setback ensuring privacy. Nicklaus Manor has resale homes in a classical architectural style, while Brikdale Court consists of just 33, primarily, lakefront home sites. 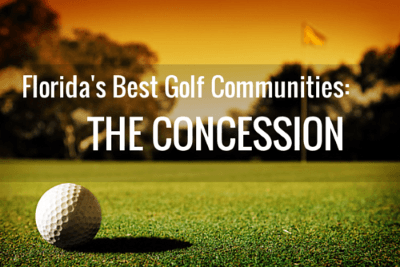 In addition to the course itself, residents of the Concession enjoy a host of other benefits. The clubhouse is a great spot for casual and formal dining or residents can enjoy a romantic meal aboard the community's private 50-foot crewed yacht. The course also has a 23-acre practice area, if you want to brush up on your putting or chipping and there is also guest accommodation available. And of course, in nearby Sarasota there is world class dining, shopping and cultural attractions.